I haven't gotten much mail back lately but a few good ones have come back. 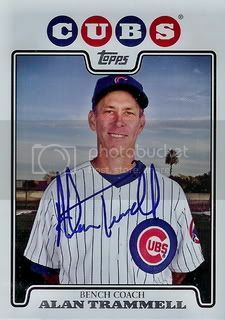 The best is probably this one of former Chicago Cubs bench coach and Detroit Tigers legend, Alan Trammell. Too weird to see Tramm in a Cubs uniform. Great signature.